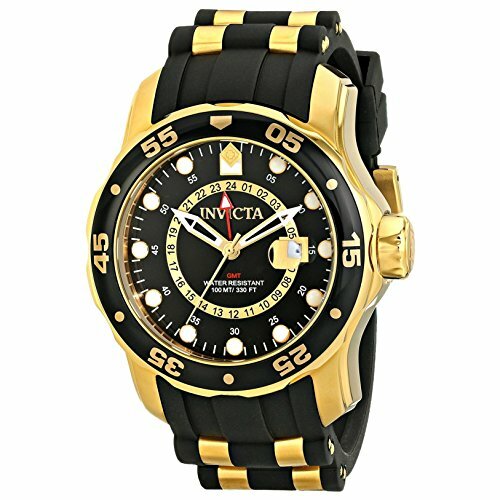 Bold black and gold features on the Invicta Men's Pro Diver Collection GMT Black Dial Black Polyurethane Watch make it an excellent fashion accessory for the athletic man. A black sunray dial has silver-tone dot indices to mark the hours and an unconventional, cool circle subdial to track them. A subdial at three o'clock displays date information. The stylish display uses Swiss quartz movement to keep precise time, and the dial is protected by a scratch-resistant mineral crystal. Cool features can be found on the unidirectional black stainless steel bezel, marked with silver-tone Arabic numerals in increments of 10. The case is a robust design in gold-tone stainless steel and connects with a modern polyurethane black and gold-tone wrist band that uses a buckle clasp to stay comfortably around your wrist. The watch is presented with a yellow gift box and is water resistant to 330 feet (100 meters).